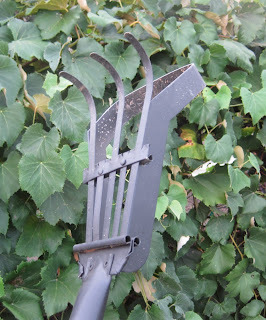 Which brings us to the question that my new hoe, the Rake 'n Hoe from Kaizen Garden poses for the gardener. Did the hoe come first and then they added the rake, or did the rake come first and then they added a hoe? One might assume that the hoe came first, because without using the hoe to chop off the weeds, what would there be to rake? 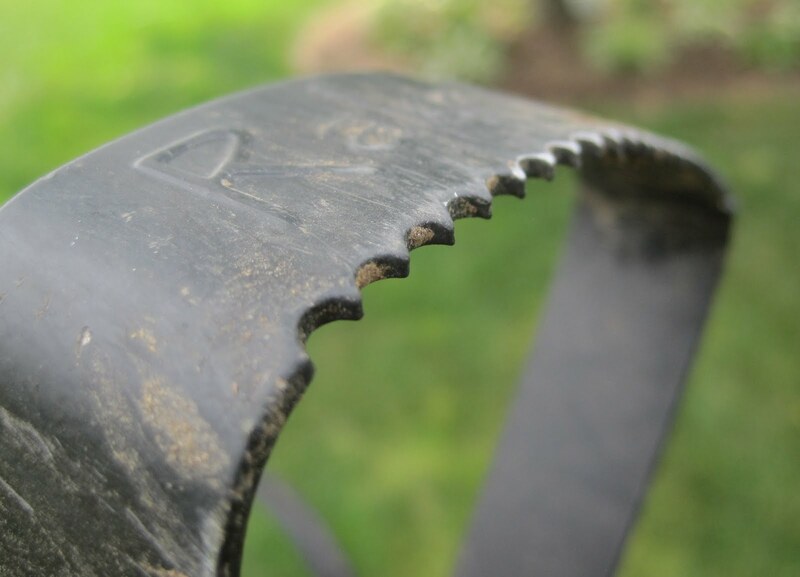 Or perhaps the rake come first because without removing fallen leaves perhaps covering the plants in the flower or shrub border, how would the gardener know which were weeds that should be chopped off with the hoe? This is a unique hoe (or is a unique rake?) and was developed by those at Kaizen Garden to improve the efficiency, and presumably the speed, that one could chop out weeds and rake them into a pile. "Kaizen" is the Japanese word for "improvement" or "change for the better". Kaizen methods are often employed in factories or any work environment to encourage continuous improvement. The improvement is that you hoe, then flip the tool over and rake. You don't have to drop the hoe, then pick up the rake. It saves time! One tool, two purposes. As I used it I found it easy to get into the swing of things... hoe, hoe, hoe, flip it over, rake into a pile. Hoe, hoe, hoe, flip it over, rake into a pile. I had two thoughts as I tried this hoe (this rake) out. I wish the rake was a bit wider. As it turns out, those Rake 'n Hoes shown for sale on the website do have wider rakes, so someone else must have agreed that "wider" was a good improvement. Kaizen! "Continuous improvement". My other thought was will the hoe stay sharp enough? I wonder with those jagged teeth how easy it will be to sharpen? 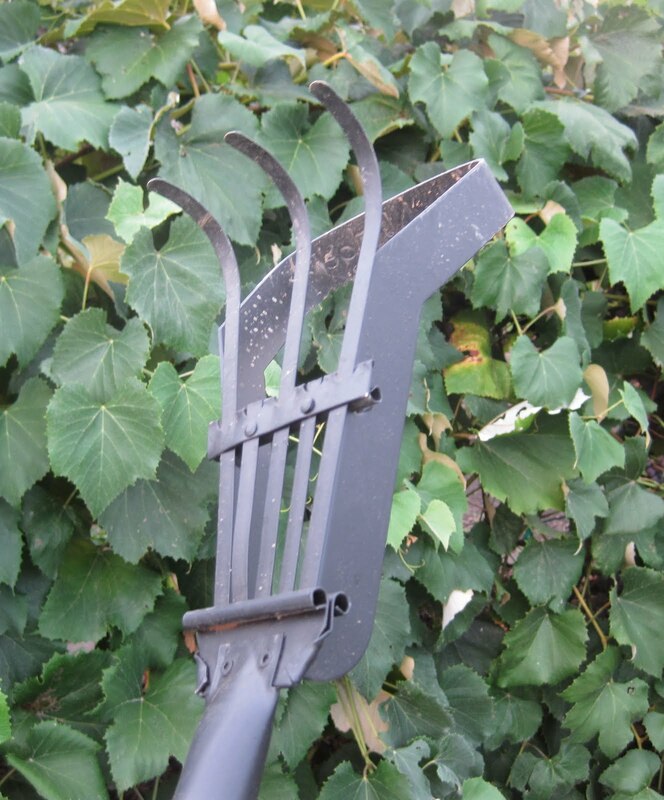 This hybrid tool can mean only one thing....you must now start a rake collection! hoe de doe, hoe de doe, its off to hoe we go. I once knew a hoe with jagged teeth and told my son not to date her. Should I rake or should I hoe? Should I rake between the seeds? Should I hoe to kill the weeds? Hmm, I look forward to seeing how you sharpen this. It sure looks handy! I like the idea of 2 tools in 1. Not only is it more efficient, it takes up less storage space, which is important to those of us with no storage shed & an overpacked garage. BTW - LOL at flaneurgardening's comment. PS. I've created a monster... All day yesterday I found myself humming should I rake or should I hoe, now? That'll teach me not to alter song lyrics for kicks! That's an impressive Hoe collection! I stick to rake and spade (because they are most useful at my terrace garden) :D. Have a good weekend.